I really like this kind of thing, as it add some flare to the game beyond the fairly simply built-in die rolls. I wanted to add a few features to the script, and the author had long since stopped supporting and updating it, so I contacted him about taking it over. He was agreeable, and I’ve released two updates to the script so far (You can find the current thread at https://app.roll20.net/forum/post/6264588/script-powercards-3-thread-5). A couple of the changes involve a system that lets you specify video and audio effects based on character attributes instead of baking them into your PowerCard macros. That way you can use generic macros and still have customized effects. This system is hard to describe in text, though, and one of the users in the tread above was looking for a better way to understand it. 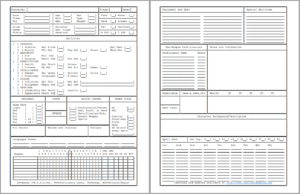 I DM a bi-weekly D&D 5E game on Roll20.net, and while we are relatively new to the platform, I’ve been refining how I use it with each session. I’d like to do a series of posts about how I use macros and API scripts to run the game, but I need to iron out the kinks first. In the mean time, I thought I’d talk about initiative. One of the things I like least about playing on a VTT is tracking initiative. Yes, there are tools built into Roll20 to help, but one of the issues I’ve had (both on a VTT and a “meat-space” game) is that usually the NPCs end up acting in a single (or a couple) of initiative points because it is just plain easier to run all of the enemy attacks at once than try to keep track of what could be upwards of 10-15 critters and when they act in the round. At the beginning of the fight, everyone rolls initiative, applies all of their modifiers, etc (this includes the monsters), but only the highest initiative result matter. Whomever has the highest initiative total takes control of the action. They can take their turn as normal (but they cannot hold their action – holding an action is the same as deciding to not take an action on their turn). When they are finished, they pass the initiative to anyone involved in the fight that hasn’t already taken an action during the round. That could be someone on their side of the fight or someone on the opposing side. After everyone has taken an action, the round ends and the last character to have taken their action decides who acts first in the next round – possibly even themselves. I created a couple of simple macros using the token-mod API script to help (one marks selected tokens as having taken an action, one marks bonus actions, on marks reactions, and one clears all three of these markers for any selected tokens), and we tried it out in our last session. Overall, I think things went very well. I explained the basics of the system and that there couldn’t be a discussion about who to select next – the acting player needs to promptly pass the initiative. The players initially thought I was nuts. When the fight started, one of the PCs won the initiative. He unleashed an eldritch blast at one of the enemies and passed the initiative to another player. They were all going to be able to act before the enemy got a chance to do anything! This was great! When the last PC acted, they wanted to pass the initiative back to the first PC. I reminded them that the enemy still needs to take their actions, so they reluctantly selected one of the enemies to act. 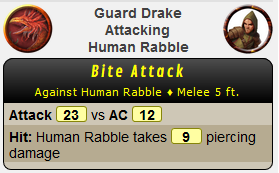 I ran through each enemy action, and finished off with a monster that was able to roll out use a special attack that grasped one of the PCs in necrotic vines, requiring a saving throw or inflicting both immobility and necrotic damage. Now that the PCs knew they had identified the most powerful member of their opposition, , they were eager to get back to their turns so they could unleash on it. Except that the apparition selected itself as the first person to act in the next round and attacked the same PC with its necrotic touch- draining her strength and inflicting additional damage. It choose one of its allies to act next, and the same happened for that ally. When half of the enemy had acted, they choose the PC stuck in the necrotic grasp to act next. This triggered the necrotic grasp’s effect again – allowing that PC to repeat the saving throw which she again failed, resulting additional necrotic damage. By this point, she was in some serious hit point trouble, was strength-drained, and in a bit of a quandary. If she attacked, she might be able to weaken the apparition – but if the priest didn’t heal her and she failed her next saving throw to escape the grasp, it was possible that the necrotic damage would incapacitate her. She ended up burning her own healing spell on herself – giving the monsters a round without her damage output. By now, the players realized that, by stacking all of their actions at the beginning of the round, they had potentially allowed each enemy to take two actions before any of the PCs got their second action. I’ve got some fairly sharp players, so right away they understood that they needed to try to ensure that they ended up with one of them going last in each round so they would control the start of the following round. (Obviously incidental chatter isn’t going to be preventable, and really that was one of the points I wanted them to realize anyway). Just as reasonably, they came to a fairly organic conclusion that the healing-domain priest should probably be really close to the end of the round so that she could provide aid if needed (perhaps to two different PCs if the round had been particularly damaging by selecting herself to act first in the following round). After that, the choices became interesting. If a character was knocked unconscious, was it better to pass the initiative to the healer (or an off-healer) to get them back up, possibly costing the PCs the coveted end-of-the-round spot? How about passing the initiative to an out-of-position player so they can move into a flaking position and gain advantage not only for themselves, but for one of their allies that may have acted before them under the standard initiative system? We’ve only played with this system once so far, but I really like it. Everyone was focused because you never knew when your turn might come up, and there were actually advantages to being late in the initiative order. I can think of lots of interesting ways to use this system to the advantage of one side or the other (if the players can set up combo attacks, the enemy can too!) I thought there was a LOT less bookkeeping required with this system as well. This places the stopwatch marker on the token to indicate they have acted in the round. At the end of the round, all active tokens will have a stopwatch – and of course anyone with a stopwatch can’t be selected as the next to act. I need to make a few refinements – I’m updating my NPC/Monster actions to include setting the “stopwatch” marker after running – why do that as two separate actions. I also need to consider how to handle things that are in effect “until the beginning of your next action” – right now they just aren’t marked and we are mentally tracking them. One of my favorite Kickstater creators is Dan Coleman, who has produced an excellent series of D&D 5E compatible adventures in his Dungeons on Demand series, and a complete campaign setting called Ebonclad as a hardback book, so when his brother Mike launched a project for a card drafting game called Rebels of Ravenport, it was a no-brainer to kick in for it. My friends and I frequently have game nights, and it is always nice to have a new game to play, especially something that is easy to pick up and plays fairly quickly. Rebels of Ravenport looks to check off both boxes. It is also nice that it supports up to six players, as that is our normal group size. 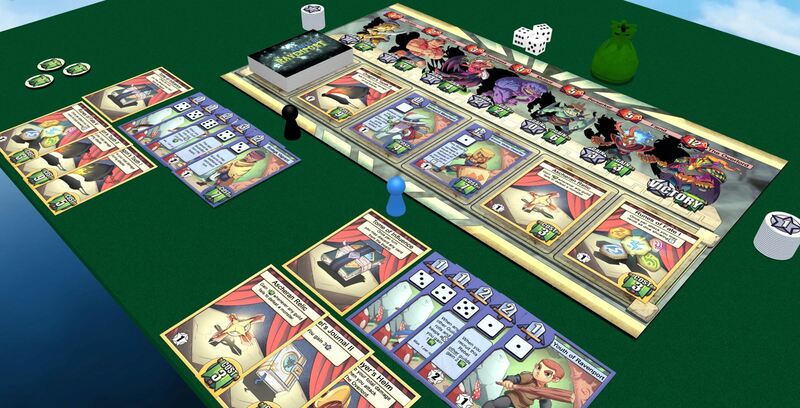 Each player in the game leads a guild of rebels in an effort to defeat the Overlord and his monster minions that have invaded the town of Ravenport. You start with a small band of rebels and defeat monsters to gain victory points and reputation. Reputation can be spent to recruit new members of your guild. Each rebel has a dice value, and rolling that number on your turn allows that rebel to deal damage to the monster you are fighting. Build up a powerful enough guild and you can challenge the Overlord himself. Killing him wins you the game outright no matter how many victory points your opponents might have collected. Players can also win by consuming the entire pool of victory points, but each of your recruited guildmembers contribute to your victory point pool as well, so there are multiple paths to boost your guild to prominence. Check it out on Kickstarter. The game rules are very straightforward, and you can even play it online for free at Tabletopia (link in the KS campaign page) as a nice try-before-you-buy. 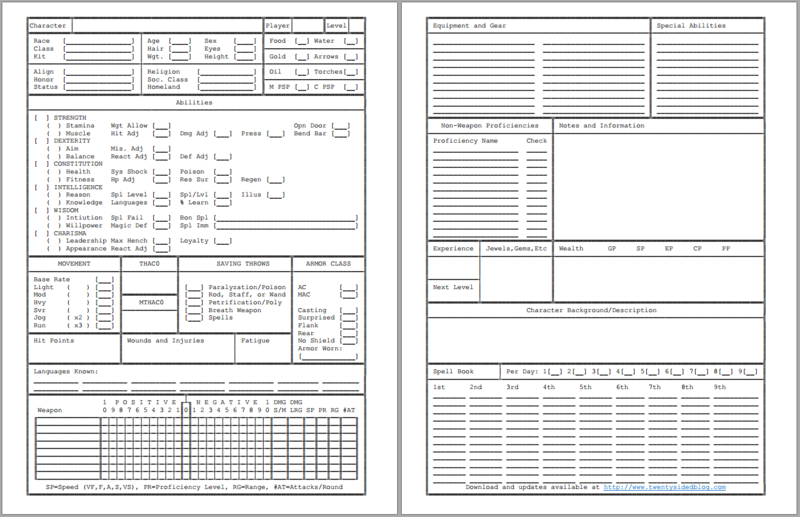 I went digging through some of my old files and located a text file I had created in a DOS text editor about 25 years ago with what I considered to be a nice character sheet for 2E. I used the old DOS line-drawing characters (we didn’t have fancy things like multiple fonts back then!) 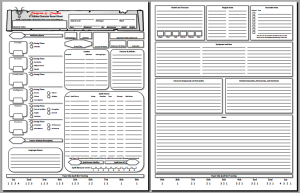 At some point I had updated it to include the Skills & Powers attributes, though it still works equally well without S&P (which we aren’t using). My last blog entry was about a fantasy console called PICO-8. Since then, I’ve been having quite a bit of fun playing around with the thing. I’m pretty bad and drawing even “programmer graphics”, but when you only have 8×8 pixels and 16 colors, it doesn’t really matter… it isn’t going to be a masterpiece anyway! Below is a GIF of the game I’ve been working on. It is coming along nicely considering that I haven’t really gotten a chance to put that much time into it. It is an old-school RPG, similar in style to the very early Ultima games. So far, I’ve got the overland map and travel working, and I’ve put together a town map system that isn’t limited by the built-in map size of the PICO console (essentially unlimited town maps, though given the size of the game I don’t really need that many – but I need more than will fit into the built-in map editor). My next project is to implement dungeons, and then flesh out the character generation and game system (stats, monsters, items, etc). Then I can populate the towns with NPCs, add quests, and the like. 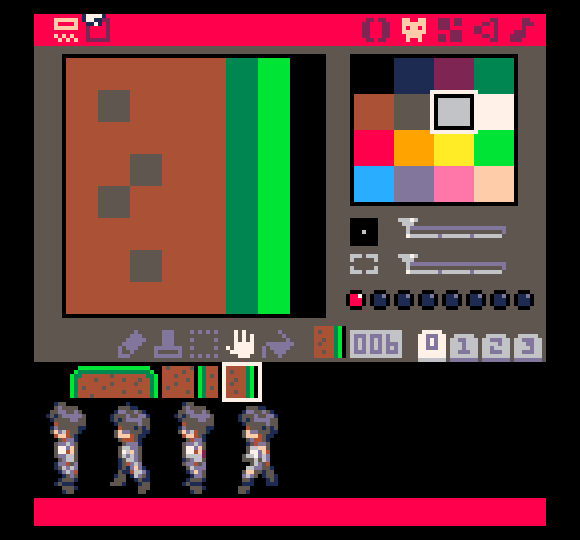 The beginnings of an old-school RPG for PICO-8. Nothing actually playable at this time, but I’m getting there. Working with PICO really reminds me of coding on the Commodore 64 (though LUA is much more advanced than C=64 Basic, and alot less tedious than 6502 assembler!) In fact, this is the kind of thing I put together on a regular basis on the Commodore. I backed the CHIP Kickstarter about a year ago, and as the shipment date for my pledge level approaches (late May, and they say they are on time), an update was posted indicating that a CHIP specific version of PICO-8 will be included with PocketCHIP. I had never heard of PICO-8, but once I knew what it was, I immediately went over and purchased a copy though their Humble store. PICO-8’s editors are all built into the console. Here is the sprite editor used to create graphics for your games. 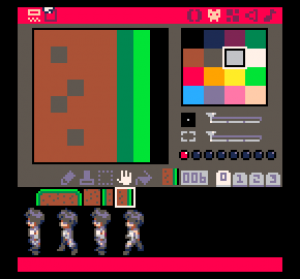 PICO-8 is described on the Lexaloffle website as a “Fantasy Console”, and is essentially a self-contained “emulator” for a console that never actually existed. The console is designed with extremely limited hardware/software specifications, intended to mimic a classic 8-bit environment. Developers can create custom cartridges that can be shared with other users or played on the web through the Lexaloffle forums. Each cartridge is limited to 32k, contains up to 128 8×8 pixel sprites, and a 128×32 cell world map. PICO-8 includes a complete development environment within the program, including code editor, sprite editor, map maker, sound effects editor, and music track editor. With the full version (not the web player) you can switch over to the code and resources for any cartridge you are playing and begin editing. You can start from scratch and create your own cartridge entirely, or modify an existing game to change it in any way you wish. Code is based on the LUA syntax, without the LUA libraries. There is a provided API that lets you play sound, display sprites, and draw maps in addition to the standard pixel and shape-oriented drawing tools. 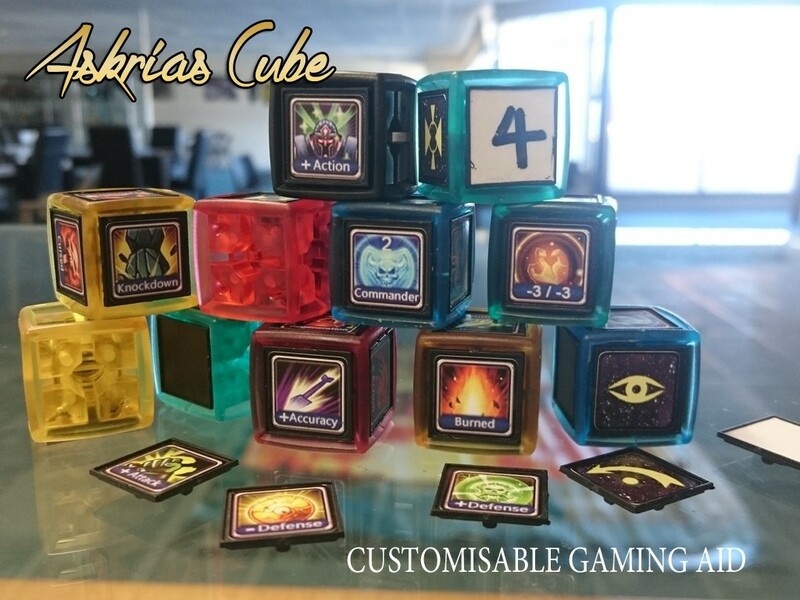 While browsing through the current gaming-related Kickstarter projects, I came across the Askrias Cube. This is a customizable 6-sided die, that can be used either for rolling random effects or for keeping track of status effects, counters, etc in a game like Magic: The Gathering. The cube itself is made of two pieces of plastic that snap together, and each face holds an insertable plastic tile. Each tile can be customized with a sticker to represent whatever you wish. The basic pledge comes with two cubes, twenty plastic face inserts, and forty face stickers, available in several different themes. The project is based in New Zealand, and the $12 NZ pledge works out to about $8 US. 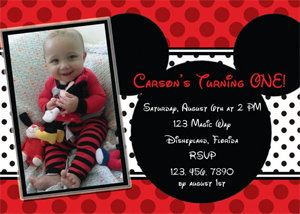 Add-ons are available for extra sets, cubes, frames, and sticker sets. File this one under just sharing, because it was frustratingly annoying until I got it working. I currently have an MSI GT 660Ti Power Edition card, and in certain games (and I haven’t determined the commonality between them yet) I was sometimes crashing, with the message “Display driver has stopped responding and has recovered” displayed in a balloon popup on the Windows desktop. Some games don’t do this at all, and others do it very predictably (like within 5 minutes of launching the game 100% of the time). Driver updates (the obvious first step) don’t seem to help, so after poking around on the web, I found a combination of tweaks that have eliminated this problem for me – though it doesn’t seem like any one of the did the job individually. First, there is the Microsoft recommended registry fix : (http://support.microsoft.com/en-us/kb/2665946). Essentially, this involves adding a DWORD (32-bit) or QWORD (64-bit) registry value called “TdrDelay” with a value of 8 to HKEY_LOCAL_MACHINE\SYSTEM\CurrentControlSet\Control\GraphicsDrivers. This is supposed to let windows wait longer before deciding that the graphics driver has crashed and taking action to get you back to a functional state. Second, I found several references to using MSI Afterburner to underclock you graphics card by 50-70 MHz (on the Core Clock slider). I dropped mine right around 50. Finally, in the nVidia control panel (accessible from the Windows Control Panel) expand “3D Settings” and select “Manage 3D Settings”. On the Global tab, I selected “Prefer maximum performance” for “Power Management Mode”. When I set these three items in combination (though I’m not sure the first one (the registry hack) has a real impact) I can play games like The Talos Principal for hours without a problem – it is one of the 5-minutes max games without these changes. Not sure exactly what is going on here (my PSU is more than up to the job of running my video card, which is the most commonly stated culprit) but can only speculate that something weird happens if the card tries to enter some sort of energy-friendly mode based on something the game is doing. There was a time, back in the day, when I couldn’t get enough Ultima. Sadly, Ultima IX fairly well put a dent in the magic of the series. I did, though, play all of the original Ultima games when they were released, including a pair of very early forays into the realm of 3D games called Ultima Underwold : The Stygian Abyss, and Ultima Underworld II : Labyrinth of Worlds. For the time, the technology in the Underworld games was pretty amazing, considering we didn’t have 3D accelerators yet, and everything was done in software. 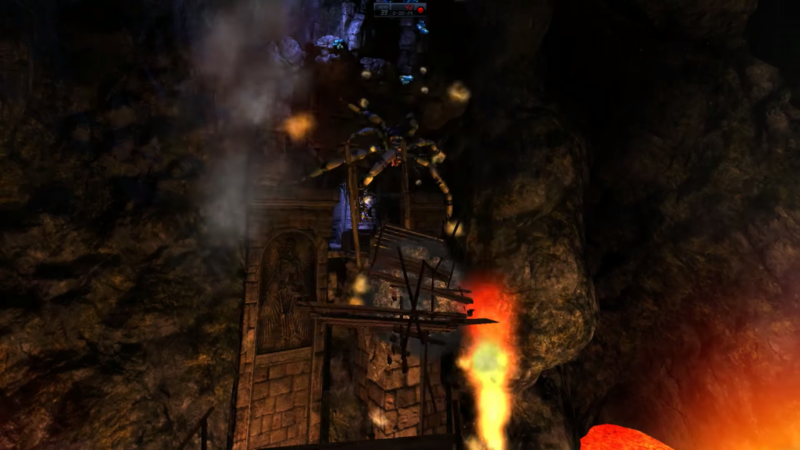 The first two games are available from GoG as a bundle, though modern players may find aspects of the game’s interface and engine frustrating. 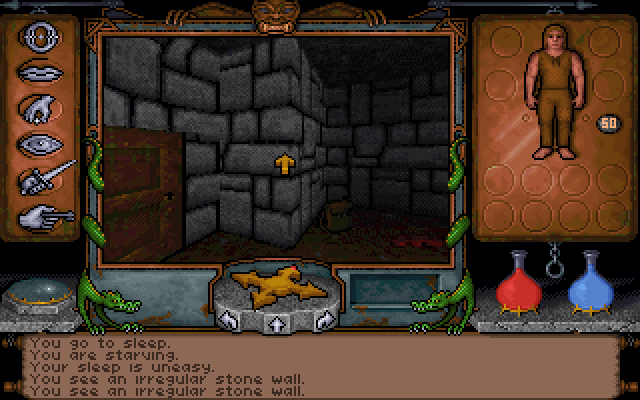 As cool as they were back then, the list of game engine features in Ultima Underworld are the kind of things that developers don’t even have to think about these days because they are built into all of the graphics cards already. Fast forward 22 years, and many members of the original team that produced Ultima Underworld (first as Blue Sky Studios, and later Looking Glass – Yes, the same Looking Glass that did the first two Thief games and the System Shock series) have launched a Kickstarter campaign to revive the franchise as Underworld Ascendant. As you can imagine, the technology has improved pretty drastically since 1992, and OtherSide Entertainment is putting together what looks to be a fitting return to the Stygian Abyss. The Kickstarter campaign lists several interesting technologies that could make for a great game if the team manages to pull them off. For one thing, they are implementing what they call an Improvisation Engine, which moves away from developer-scripted storytelling and builds a custom story around the player and the choices and actions they take in the game. Stretch goals include an “Underworld Builder Toolkit”, and the addition of Co-Op multiplayer. The revival of old RPG franchises on Kickstarter is becoming something of a trend, with Shadowrun, Wasteland, Torment, and now Ultima Underworld (and soon the Bard’s Tale!) all getting the Kickstarter treatment. In my opinion, this is a great thing. These were the games I grew up with, and returning to these worlds has been, and I hope will continue to be, great fun. Head on over to the Kickstarter page and back the project! As of this writing there are still a couple hundred $20 slots left that get you the game when it is released (estimated to be November of 2016).